Dunmeri patron saint of butchers and fishmongers. 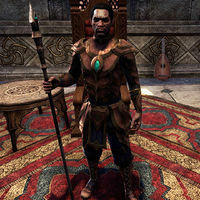 A fierce warrior, he slew many Nord invaders and drove them from Morrowind. He could neither read nor write, instead being blessed by receiving inspiration directly from the lips of Almsivi. The Cleaver of St. Felms is a holy relic greatly prized by the Tribunal Temple. Frandar do Hunding Hel Ansei No Shira, commonly known as Frandar Hunding was born in 1E 720[nb 1] in the province of High Desert in Yokuda. Frandar is the only "given" part of his name: "Hunding" is the name of the region of his birth; "No Shira" means person of noble birth and "Hel Ansei" is his title of Sword Sainthood. Along with his son, Divad, he is the most famous of the Yokudan Sword-singers. High Queen of Eastern Skyrim sometime during the Second Era, ruling from her seat in Windhelm. After King Logrolf's assassination in 2E 431, Jarl Svartr of Solitude claimed that Logrolf's daughter, Freydis, was illegitimate, and the Moot gathered to determine Logrolf's successor. Though Freydis was able to wear the Crown of Verity, a magical artifact created to test the worthiness of candidates to the throne, and thus named High Queen in Windhelm, a partial Moot in Solitude proclaimed Svartr as High King. Skyrim was thereafter split into the West Kingdom, ruled by Svartr and his successors, and the East Kingdom, ruled by Freydis and her successors, who renamed the Crown of Verity in her honor. ^ Oengul War-Anvil's dialogue in Skyrim. Esta página foi modificada pela última vez à(s) 14h26min de 19 de maio de 2015.